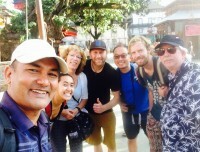 Free Tour Kathamndu is the first of its kind in the Kathmandu Valley. 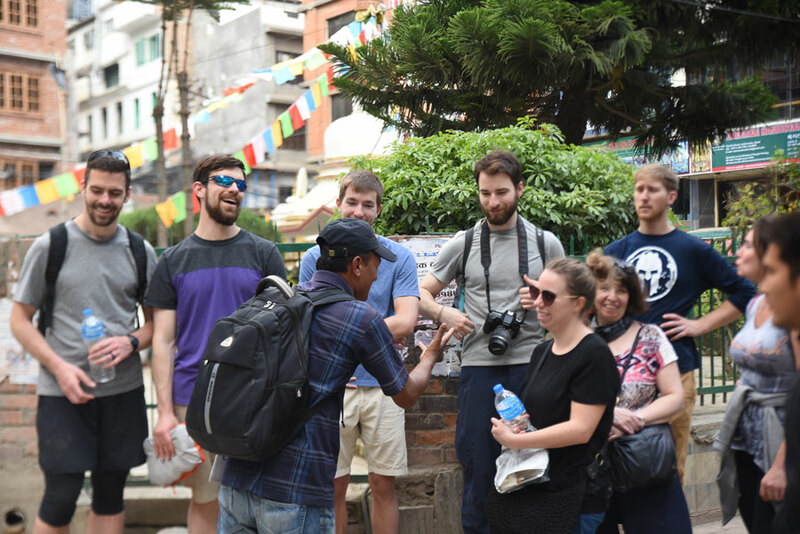 While other walking tours exist, this is the only one that provides a free glimpse of the highlights of Kathmandu, led and narrated by a dedicated tour guide with decades of experience. Winding through the heart of the old centre of Kathmandu, the Free Walking Tour encompasses some of the iconic temples, stupas, monasteries, palaces and local Newar architecture that define Nepal’s capital city. 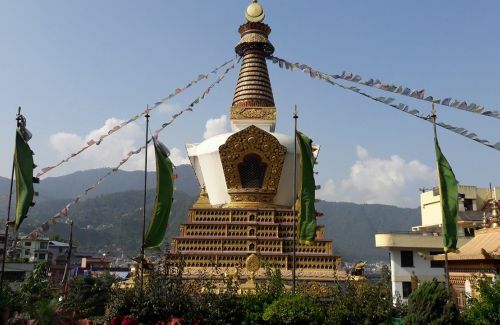 Departing from just outside the Garden of Dreams 7 days a week (9 am and 2 pm), the tour passes through the southern part of Thamel via the Kathesimbhu stupa and surrounding Buddhist monasteries; before entering more ‘local’ streets towards the market at Indra Chowk. From there, the tour passes around Durbar Square and goes through a sleepy Newar neighbourhood towards the local cremation centre near the sacred Vishnumati River. Crossing the river, the tour passes through the suburb of Swoyambunath before finishing at the top of the picturesque ‘Monkey Temple’. At this point, the guide will either walk you back to Thamel or will direct you to where to get a bus or Taxi. The Kathe Swoyambhu is one of the many embodiments of how different religions and cultures coexist peacefully in Nepal. Not only is it very photogenic, it also serves as a great place to learn about Hindu, Buddhist and Tibetan cultures all at one place. There are small stupas around the main stupa which have symbolic paintings on them. Like many other sites, this is also undergoing construction. Many visitors like to try the local lassi near the glass-bead market. Made with sugar, churned yogurt and garnished with dried fruits and concentrated milk (khuwa), this is a drink that is a must try! Its freshly made and is very refreshing. One small glass costs NPR 40 and the bigger glass costs NPR 70. The glass bead market is a spectacle to look at. For many generations, Kathmandu’s Muslim minority have made and sold colourful glass beads for Hindu ceremonies. It is a local, wholesale market which sells (among other colours) iconic green glass bead necklaces which are given to local brides during weddings. The colourful market looks similar at the first glance, but some shops offer unique designs also. The Swoyambhunath Temple is often called The Monkey Temple because of the hundreds of monkeys can be seen there. They are not violent, but they do have their natural defenseman mechanisms when they feel attacked; and will pester you if you have anything sweet on you! The temple had 365 steps before the earthquake, signifying the 365 days of the year. But, after undergoing re-construction, one has to climb 424 steps to reach the temple. The temple stands on a very aesthetic site, overlooking the valley of Kathmandu. One can shop souvenirs from there or simply witness the majestic skyline of Kathmandu. The stupa also has a lot of symbolic significance conveyed through the carvings and paintings. Out of over 350 reviews on TripAdvisor, 94% rate the Free Walking Tour as ‘Excellent’ or (86% go with ‘Very Good’). Previous visitors have come from a wide range of countries and have included both ‘first timers’ and seasoned travellers to Nepal. 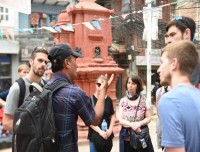 Note: Please we would like you to confirm prior to Free Walking Tour and Free Walking Tour Kathmandu is a tips-based model which means you award the time and experience the guide, sharing with you. Your personal expenses like tea, coffee, mineral water etc. Day 01Free Walking Tour Kathmandu, 4-5 hours through local areas, visiting Hindu temples, Busdhist Stupas, and ShrinesWe begin Free Walking Tour from the front gate of Garden of Dreams, a beautiful Garden in the east of Thamel, close to Narayanhiti Museum sharp at 9:00 am in the morning, and at 2:00 pm in the afternoon in every Sunday, Monday, Tuesday, Wednesday, Thursday, Friday and Saturday. You are given pre-departure information about the route, timing and the way we return back to Thamel again. We head towards the southern part of Thamel, and visit around Thahity. Then, after visiting Katheswoyambhu and Bangemudha, we take you to the local market area. We pass through oldest and liveliest, bustling markets like Asan and Indrachowk: visiting glass beads shops, cross the road and we will go to the northern gate of Kathmandu Durbar Square. From there, we go through typical Newari residential area named Yatkha and visit a local temple dedicated to mother goddess, Kankeshwori Chamunda where there we see a local cremation place for the local community. We walk again 45 minutes to the hill, the Monkey Temple, walk around and get back to Thamel the other way. 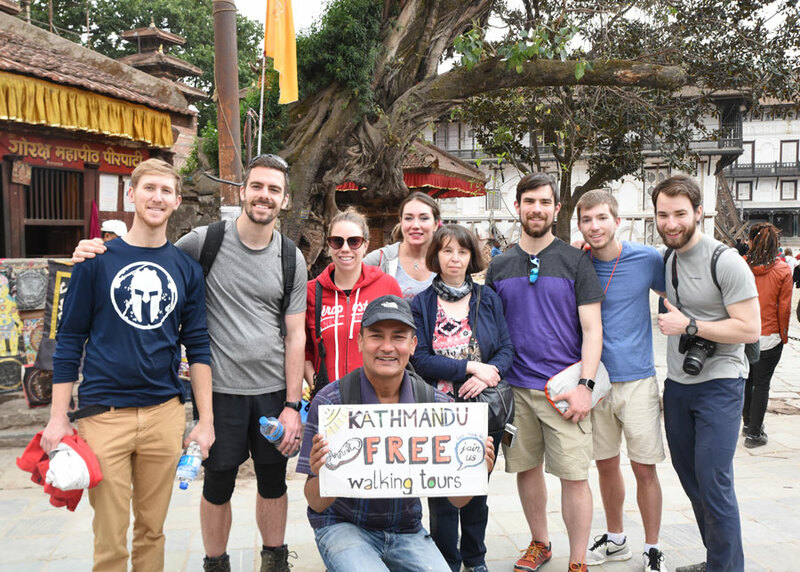 This is how we offer you Free Walking Tour Kathmandu in two important heritage sites within 3-4 hours, depends on your pace. The tour departs daily at 9am and 2pm from the entrance of the Garden of Dreams, a 5-10 minute walk to the east of Thamel. It is best to notify Shiva beforehand if you are interested in joining the tour, although they usually run daily in the busy season and anyone is welcome to join! The average tour time is about 4 hours, but it is completely tied to the pace of the guests. Some prefer to get a bus or taxi part of the way which reduces the time, and there is also flexibility for visitors that want to take the odd detour or stop for food/drink on the way! There is no minimum amount. The solo traveller is also very welcome. Average group sizes tend to be between 5 -10. The largest group has been 23, but any number larger than 25 can be difficult as the route passes through a lot of narrow streets busy with traffic. Feel free to contact Shiva for any group enquiries. Am I expected to tip? Tipping is not compulsory but is greatly appreciated on a ‘pay as you feel’ basis. There is a 200-rupee ($2) charge to enter the monkey temple, but this is the standard rate applied to everyone and none of it goes to Shiva himself. Is the Free Walking Tour available in other languages? The tour is only available in English. 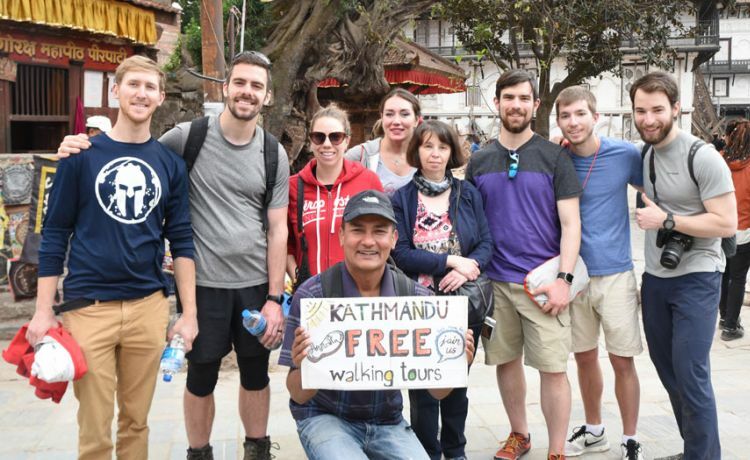 The Free Walking Tour has been organised and managed by Shiva Dhakal; a government-certified tour guide, with a Bachelor’s in tourism and a master’s degree in English Literature. Previously working as a porter and trekking guide, Shiva has 20 years’ experience as a dedicated tour guide, and for the last three years has managed his own tour company, Himkala Adventure. For some years, Shiva and his family have also been accommodating the occasional international guest. It was one of these guests that gave Shiva the idea for the walking tour, imitating the ‘European’ model of free city tours. Shiva has been running the Free Walking Tour for the last 14 months and has already shown over 3500 visitors around the city. He has a keen interest in the local history of the city which reflects well on his delivery; with a wealth of information on local cultural practices, traditions and beliefs, as well as on the varied architecture, archaeology and iconography that can be found in the heart of Kathmandu. Himkalaadventure.com is trading name of Himkala Adventure Pvt. Ltd. All content, photography & videos within this website is copyright and may not be reproduced without our permission.